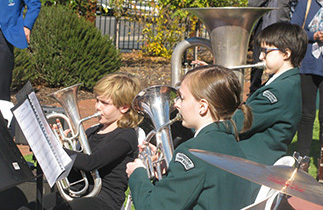 The Hahndorf Youth Band is a product of the brass training and development program currently administered by the organization, and has been in place in various forms since the early 1960’s. 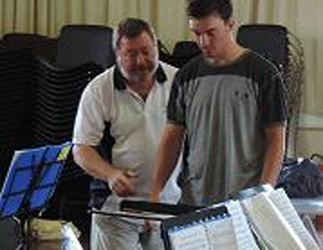 Several of the Band’s current senior players are a product of the Hahndorf Youth Band program. The Youth Band is currently trained and directed by the Band’s Education Coordinator and Musical Director Mr Philip Paine, and is available to play for community events and functions. The Youth Band always welcomes and encourages new students, and all enquiries should be directed to the Youth Band Administrator, Kathy Francis on (08)83887280. On December 7th the residents of St Pauls Lutheran Home were entertained by the Hahndorf Youth Band, showcasing their talents, either as soloist, duets, as well as the complete band. The youth band played for the residents Christmas Carols as well as other entertaining pieces. This event is thoroughly enjoyed by the residents of St Pauls and is always a pleasure for the youth band to do. Following this mini concert the Youth Band then joined our Senior Band at the Hahndorf Town Band Hall for an end of year break up celebration. Throughout the year the members of the youth band, are encouraged to increase their knowlege and skill in the music field, while still experiencing the pleasure and fun of learning a brass instrument. The “Anthony Havriluk Memorial” trophy (Anthony was a past member of the Youth Band) is also presented to a Youth Band member each year. Congratulations to Jayden White who plays cornet was the 2015 recipient. We would like to thank Philip Paine and Kathy Francis for all the hard work that they both put into this program throughout the year and look forward to the adventures of the Hahndorf Youth Band in 2016.